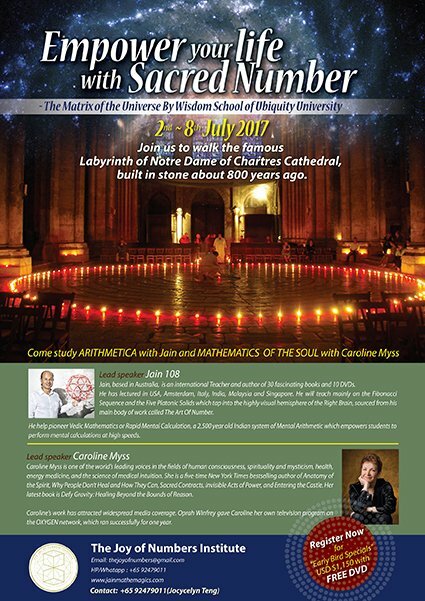 Jain is teaching for 5 days, morning and afternoon, from July 2nd to July 8th 2017, on ARITHMETICA, with Caroline Myss who is lecturing on MATHEMATICS OF THE SOUL, in the middle of the day. since the completion of the Notre Dame Chartres Cathedral. also known as Ubiquity University. of highly educated and spiritually-minded teachers. The Wisdom University goes through a process of honouring the 7 Liberal Arts, over 7 year periods, covering topics Like Musica, Astronomica, Geometrica, Rhetorica (Power of Words) etc and this year it is Arithmetica, so I am honoured to be Pythagorean representative for this important subject. Alternative Flyer, showing the top-down view of the 700 year old stone Labyrinth. and also to enter the crypts below. Outline of Content of the 5 days of Seminars. A specially made set of worksheets and or workbook will be supplied for all 5 days.